I myself have never watched or read any anime so this was a very interesting read. When I first read Azuma’s Otaku, I was a little lost when it came to understanding what it meant to be a part of database consumption but after connecting them with aspects of Korean dramas, I can see what it means to pick out specific characteristics, appearances, or themes that would fit into an ideal show. I think its really interesting that this anime used the concept of the database consumption and used small narratives to lure in viewers and caught them off guard by creating a grand narrative. It makes me wonder if you think that grand narratives could make a comeback into Japanese popular culture? Do you also think that people are reverting back to the desire for a grand narrative or if they were just interested in the unexpected plot twists? This was a great introduction to the world of anime for me and it was very interesting to read about! I thought your analysis on magical girl anime and not so typical magical girl anime was very insightful, and I really enjoyed reading it. Firstly, It was very interesting to learn how fans reacted when they learned about death of one of main characters. I have witnessed similar types of reaction from other cases, and this is quite understandable regarding fans’ emotional attachment to the characters. What was even more intriguing to me was that, they were more upset because the death was “so sudden and without warning.” It made me wonder if they would have taken it better or encouraged it if they knew it was coming. I’m not too familiar with the fans’ attachment to the storyline itself, as opposed to the characters. I know in Korea, the writers often change their original scripts because the fans don’t “allow” certain characters to die, or they would beg the writers to put more screen time, etc. I guess I was wondering if fans of Japanese anime entertained this sort of privileges or power. You mentioned how Madoka Magica started off similar to any other magical girl animes, but “took a darker, more psychological turn” after a few episodes. I found this to be extremely interesting, and made me curious — do you think it was because the directors wanted to attract the otaku fans of generic magical girl animes beforehand, so that they would still have a relatively large fan base even after the darker turn? Or do you think they did not care what the audience might think, but rather wanted to create a bigger impact or contrast of their distinguished darker theme? As much as I am biased to think that every Japanese anime I encounter are well-made, I can tell that Madoka Magica is no exception, based on the clip you uploaded. It is not surprising to hear that it was very successful, but I’m curious of why that might be. I noticed the anime still presented a number of typical magical girl anime components, but do you think its success is ultimately due to its storyline and uniqueness? If so, do you think there is a separate fandom for this specific genre of anime (darker magical girl? ), or it’s a help from a fandom for anything-dark, or perhaps a fandom for anything-new? I had a great time reading your post, and thank you for sharing your insight on this topic. The fact that Madoka Magica uses its grand narrative to criticize the magical girl/postmodern database consumption genre is itself a very postmodern thing to do. A few other anime seem to do the same thing with their respective genres (Kill la Kill, Attack on Titan) with an equal amount of popularity, both in Japan and in the United States. Do you think this may be a growing trend within anime and manga as a whole? Is the “database culture” falling out of fashion as other consumers search for the grand narrative in popular genres? 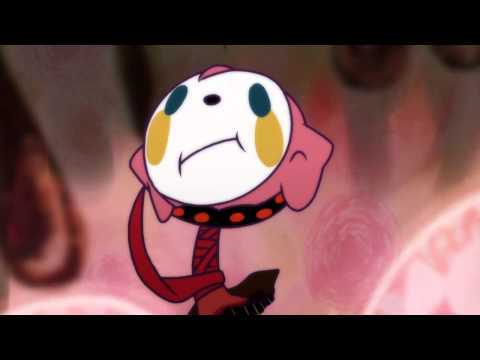 I’m also curious as to the depiction of gender roles or gender expectations in Madoka Magica. The style and genre both fit very feminine ideals. Do the creators of the show use these to twist the viewer’s expectations of what femininity is? And how did viewers respond? Nice article! I almost thought of doing a topic like this myself, haha. I like how you noted that Madoka Magica uses its moe elements as a means of developing the overall grand narrative. It’s interesting the way that Madoka Magica is able to simultaneously evoke the database consumption of moe elements along with proposing a grand narrative–it’s almost as if the two things don’t necessarily have to battle one another, but exist and be consumed at the same time. Do you think the creators did this database-narrative hybrid anime in this manner as a sort of stepping stone so that full fledged grand narrative anime could come into the popular sphere? Or is Madoka Magica equal parts database and grand narrative? I can’t say with certainty that plot-driven anime series are on the rise, but I do think that a recent trend in short, 12-ish episode series may be helping in pushing for plot-driven anime. Like you noted, Madoka Magica avoids repetitive arcs /because/ it’s short (and thus forcing a plot to fit in the 12 episodes), while longer series are better agents for repetitive arcs. Though it may just be the case that subversion and self-parody of established anime tropes may be on the rise, rather than a push for full-blown plot-driven anime. There are a number of examples–even a Magcial Boys anime–that have gained popularity due to being a subversion of the genre while still utilizing moe elements. Do you think subversion may be linked to plot-driven stories? Or maybe it’s independent? Anyway, really interesting topic with lots of possibilities, thanks for sharing!